Born in 1748, Francis was the son of a merchant of Grenoble in France; he was the tenth of fifteen children. The family was deeply religious, and several of its members were already consecrated to God. Francis attended the Jesuit college at Grenoble, and in 1769 entered the novitiate of the Lazarists, a missionary Community founded by Saint Vincent de Paul. He was ordained a priest in 1773, then taught moral theology in a diocesan seminary. In 1789 he was named director of the Lazarist Seminary in Paris, but was obliged by the fury of the revolution in that year, with the entire Congregation, to abandon the mother house. 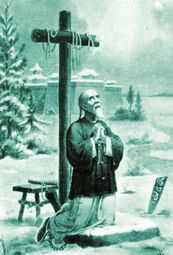 Saint Francis exposed his desire to be a foreign missionary to his superior, and was sent by him to China in 1791; there he labored for 28 years, entirely alone for several years in a vast district. Death had deprived him of his two brother-priests. Persecutions in 1812 and 1818 destroyed his church and schoolhouse, and he himself escaped several times, as it were by miracle, from searching parties. But he was finally betrayed by a Chinese Christian for a large sum of money, and seized in June of 1819. For five weeks he endured cruel tortures in total silence, then was transferred to another prison, where he found a fellow Chinese Lazarist from whom he could receive the Sacraments. His death sentence was pronounced in January of 1820, and he died in February of that year, strangled while tied to a stake erected like a cross. When you give alms, do not let your left hand know what your right hand is doing.